In May 1943 units of the German Army were stationed in the Ukrainian city of Vinnitsa, a community of 100,000 persons in a primarily agricultural district. Ukrainian officials in Vinnitsa told the Germans that five years earlier the NKVD — the Soviet secret police, very similar to our FBI — had buried the bodies of a number of executed political prisoners in a city park. The Germans investigated, and within a month they had dug up 9,439 corpses from a number of mass graves in the park and a nearby orchard. Unlike the Poles murdered in the Katyn Forest, all of these bodies found at Vinnitsa were those of civilians, most of them Ukrainian farmers or workers. The bodies of the men all had their hands tied behind their backs, like the Polish officers at Katyn. Although the men’s bodies were clothed, the bodies of a number of young women were naked. All of the victims had been shot in the back of the neck with a .22 caliber pistol, the trademark of the NKVD executioners. Including the autopsies already performed by Ukrainian medical personnel in Vinnitsa, 1,670 of the corpses were examined in detail. The identities of 679 of them were established either through documents found in their clothes or through recognition by relatives, who flocked to Vinnitsa from the surrounding countryside when they heard that the graves had been uncovered. The authorities estimated that in addition to the 9,439 bodies exhumed, there were another 3,000 still in unopened mass graves in the same area. The international team concluded that all of the victims had been killed about five years earlier — that is, in 1938. Relatives of the victims who were identified all testified that the victims had been arrested by the NKVD in 1937 and 1938. The relatives had been told that those arrested were “enemies of the people” and would be sent to Siberia for 10 years. None of the relatives had any idea what the reason was for the arrests and testified that those arrested had committed no crimes and were engaged in no political activity. As I said earlier, nearly all of the victims were farmers or workers, although there were a few priests and civil servants among them. By interviewing a large number of people who had some knowledge of what had happened in Vinnitsa and the surrounding region in 1938, the Germans were able to piece together the following picture. In 1937 and 1938 gangs of the NKVD’s jackbooted thugs roamed the villages and towns of Ukraine, arresting people in a pattern that seemed almost random to observers. One victim’s wife reported that as the NKVD goons dragged her husband away they said only, “Hey, you dog! You’ve lived too long.” Other observers thought they saw a pattern. A Ukrainian who was renting a part of his house to a Jewish lawyer refused to sell the whole house to the Jew when he offered to buy it at an unreasonably low price. A few weeks later the Ukrainian homeowner was arrested by the NKVD. Another Ukrainian who had threatened to beat up a minor communist functionary who made a crude pass at his sister was arrested shortly thereafter. It seemed that many of the arrests were the settling of personal scores and that anyone who had crossed a Jew was especially likely to be arrested. Ukraine was the stronghold of the kulaks, the independent farmers and small landowners, always regarded with special hatred by the communist bosses. 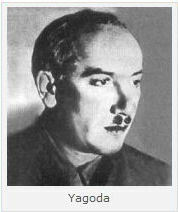 Stalin gave the job of exterminating the kulaks to his right-hand man in the Kremlin, Lazar Moiseivich Kaganovich, known later as the “Butcher of Ukraine.” Kaganovich, the most powerful Jew in the Soviet Union, supervised the collectivization of Ukrainian farms, beginning in 1929. To break the spirit of the kulaks, the Ukraine was subjected to an artificial famine. The NKVD and Red Army troops went from farm to farm, confiscating crops and livestock. The farmers were told that the food was needed for the workers in the cities. None was left for the farmers. And in 1933 and 1934 seven million Ukrainians died of starvation, while Kaganovich watched and gloated from the Kremlin. Perhaps in 1937 and 1938 the bosses in the Kremlin simply thought that it was time to apply the lash to the Ukrainians again. In any event, the NKVD was given the task this time. The NKVD was even more Jewish than the rest of the Soviet communist apparatus. 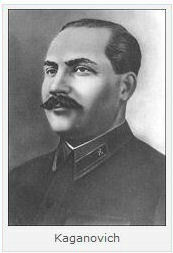 The commissar of the NKVD until September 1936 had been the Jew Genrikh Yagoda, and he had staffed his instrument of terror and repression with Jews at every level. And those who were not Jews were the worst sort of Russian and Ukrainian rabble, the resentful louts and ne’er-do-wells who saw in communism a way to get even with their betters. In any event, the Ukrainians were fully aware of the preponderance of Jews in the secret police, and they suspected that there was a Jewish angle to the pattern of arrests in 1937 and 1938. And indeed, it did seem as if the Talmudic injunction to “kill the best of the Gentiles” were being followed, for those who were arrested seemed to be the most solid, the steadiest, the most reliable and irreproachable of the Ukrainians. Thirty thousand were arrested in the Vinnitsa region alone, and most of these eventually were sent to the NKVD prison in the city of Vinnitsa. This prison had a normal capacity of 2,000 prisoners, but during 1937 and 1938 it was packed most of the time with more than 18,000 prisoners. Throughout much of 1938 a few dozen prisoners were taken from the prison each night and driven to a nearby NKVD motor pool area. There their hands were tied behind their backs and they were led, one at a time, a few hundred feet to a concrete slab in front of a garage. The slab was used for washing vehicles, and it had a drain at one side with an iron grating over it. Just as the prisoners reached the edge of the slab they were shot in the back of the neck, so that when they fell onto the concrete their blood would run into the drain. This was what the NKVD men jokingly called “mokrii rabota” — “wet work” — and they had had plenty of experience at “wet work.” A truck parked next to the slab kept its engine racing so that the noise of the engine would cover the sound of the shots. While the next prisoner was being led up, a couple of NKVD men would throw the corpse of the previous prisoner into the truck. When the night’s quota of victims had been murdered the truck would drive off with its load of corpses to the fenced-in park or to the nearby orchard, where new graves already were waiting. And this “wet work” went on night after night, month after month. So why is this gruesome story important to us now? After all, this massacre of Ukrainians in Vinnitsa took place 60 years ago. I’ll tell you why it’s still important to us, aside from the fact that these Ukrainians were our people, our kinfolk, part of our race. First, you might ask yourself why you have never before heard about Vinnitsa, and I’m sure that’s the case for about 99 per cent of our listeners. Of course, Alexander Solzhenitsyn wrote about what happened at Vinnitsa, in the third volume of his Gulag Archipelago, but you’re not likely to find that in the rack at the checkout counter. And Ukrainians and Germans have written about it, although for the most part their writings have never been published in English, because publishers in this country understand that it would be Politically Incorrect to publish anything about Vinnitsa. Much better that people just forget about it. Isn’t that odd, though, when we continually hear so much about Auschwitz? Isn’t it odd that when Jewish groups are using their political influence to have laws passed in a number of states requiring high school students to take courses about the so-called “Holocaust,” what happened at Katyn or at Vinnitsa is never mentioned in high school? The excuse given for requiring students to study the so-called “Holocaust” is that it was the greatest crime in history, and we should know about it so that we won’t repeat it. But then why shouldn’t we learn about Katyn and Vinnitsa and Dresden and a thousand other atrocities where our people were the victims, and so the lesson should be even more pertinent for us? You know, I’m not trying to be cute about this. We all know the answers to these questions, but I just want you to think about their significance. To them, Auschwitz is important because Jews died there, and Vinnitsa is not important, because only Gentiles were killed there. The Jewish media bosses keep rubbing our noses in Auschwitz, because they want us to feel guilty, they want us to feel that we owe the Jews something for letting it happen. The Jewish media bosses never mention Vinnitsa because Jews were the guilty ones there. Besides, they make a lot of money by promoting the “Holocaust.” It’s certainly not going to help their profits to divide the attention and the sympathy of the American public between Auschwitz and Vinnitsa. And it’s certainly not going to help their effort to extort billions of dollars in “Holocaust” reparations from the Swiss and from everyone else to admit their own guilt at Katyn and Vinnitsa. Think about it! If Poles controlled the news and entertainment media in America, we’d hear a great deal more about Katyn, I suspect. If Germans controlled our media we’d hear much more about the terror bombing of Dresden. And if Ukrainians controlled our media, every high school student would know about Vinnitsa. But it’s the Jews who control our media, and so all we hear about is Auschwitz: never even a whisper about Vinnitsa. That’s important. We ought to be concerned about that. We ought to be concerned whenever any part of our history is suppressed, is hidden from us. We ought to find out why. It might help us to make sure that what happened to us at Vinnitsa never happens to us again. The crux of this matter is that the Jews have been getting away with presenting a grossly distorted version of history to us, a version in which they are the completely innocent victims, and our people, the Ukrainians and Poles and Germans are the bad guys who have been persecuting the poor Jews for no reason at all. They’ve been pumping out this propaganda in concert, consciously and deliberately, without a single major medium under their control deviating from their party line. And people try to tell me that, well, the Jews may control the media, but they don’t conspire with each other. Baloney! And because they’ve been getting away with giving us a falsified version of history, they’ve been able to change America’s foreign and domestic policies in directions to suit themselves, to our enormous disadvantage. Everything which has happened in the Middle East, for example, since the Second World War is based on this false history. More than that, everything that has happened in Europe since the murder of 12,000 Ukrainians at Vinnitsa in 1938 has been based on the Jews’ power to control what we learn about our history, about what is happening and has happened in the world around us. The U.S. government allied itself with the Soviet government in 1941 for the purpose of destroying Germany. The communists were presented to the American public as the good guys, as worthy allies, and the Germans were presented as the bad guys. And the American public bought that lie because they didn’t know about Vinnitsa or about a thousand other atrocities committed against our people by the communists. When the Germans brought in the international commission to examine the graves in Vinnitsa in 1943, the Jew-controlled media kept the news from the American people, just the way they kept the news about the Katyn Forest genocide away from the American people. And because of this, there was no real opposition to turning half of Europe over to the communists at the end of the Second World War. If Katyn and Vinnitsa had been publicized, so that every American voter knew in detail what the NKVD had done at Katyn and at Vinnitsa, the politicians in Washington never would have been able to get away with turning the Poles and the Hungarians and the Rumanians and the Bulgarians and the Croats and the Serbs and the Czechs and the Slovaks and the Baltic peoples and all of the Germans in the eastern part of Germany over to these communist butchers. The politicians in Washington got away with this not just because they were in the pockets of the Jews, but because the American people weren’t given the truth. And because we weren’t given the truth millions more of our people died at the hands of the NKVD after the war, and all of eastern Europe was plundered by the communists for 50 years, and there was a Korean War and a Vietnam War — which there wouldn’t have been if we hadn’t kept the communist empire alive because of our own ignorance, because of the lies we’d been told about what happened in Europe. We lost more than 100,000 of our best young men in the Korean and Vietnam wars alone. And there is some urgency about this, because the Jews are continuing to push for laws against what they call “hate speech” — which means any speech which contradicts their lies. They have succeeded in getting such laws passed in other countries. If I tried to make this broadcast in Canada or Britain, for example, the police would arrest me and shut down the station before I could finish. Let’s not let that happen in America. The history no one is suppose to know. The other Holocasut we never heard about. Under Stalin if you were Anti Semitic you were put to death. 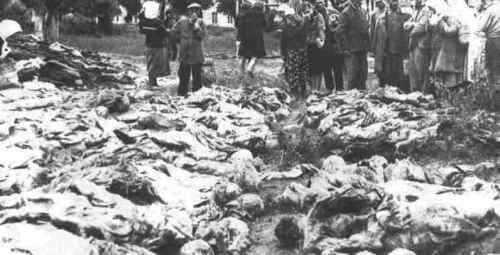 Bykivnia – containing an estimated 120,000 – 225,000 corpses. Kurapaty – estimations range from 30,000 to 200,000 bodies found. Butovo – over 20,000 confirmed killed. Many other killing fields have been discovered several as recently as 2002.In the areas near Kiev alone, there are mass graves in Uman’, Bila Tserkva, Cherkasy and Zhytomyr. Some were uncovered by the Germans during WWII; Katyn and Vinnitsa being the most infamous. The man-made Famine of 1932-1933 in Ukraine may be receding into the ever more distant past, but 65 years after, its legacy remains. It’s one of those cataclysms that launched massive undercurrents with profound historical impact. Tragically, it’s also an event of cosmic magnitude that barely registered on world consciousness when it occurred and is scarcely remembered today. Here’s what happened: In April 1929, Joseph Stalin ordered the first Five-Year Plan, in which he decreed that Soviet agriculture be collectivized by the end of 1933. For individual farmers that meant turning their land and livestock over to the state and becoming workers on giant collective farms. Not surprisingly, there was widespread resistance, particularly in Ukraine. The official press – in the Soviet Union there was no other kind – began denouncing reluctant landowners as “class enemies,” “rich kulaks exploiting the masses.” That set the stage for Stalin’s decree at the end of December 1929 to “liquidate the kulaks as a class.” In Ukraine, primarily a peasant society, that was just about everybody. The Russian heartland, with its age-old tradition of the “mir” or commune, had few independent farmers and therefore few “kulaks,” as Stalin defined them. As voluntary collectivization stalled, Stalin turned up the heat with arrests, evictions and confiscations until finally in 1932 he unleashed an army of Communist Party activists who laid siege to thousands of Ukrainian villages, raiding homes, taking every grain of wheat, every scrap of food they could find. Like many Ukrainian Americans, I’ve always seemed to have known about the Famine. I’m Catholic, but from time to time I would go to Holy Trinity Ukrainian Orthodox Church in Cleveland, where I heard some memorable sermons delivered by the Rev. Kovalenko about what he had lived through as a boy in Poltava during the Famine. My hair would stand on end. I remember the passion and pain in the Rev. Kovalenko’s face, his sermon ending with a warning about the consequences of Godless atheism. I no longer recall the words themselves, so instead let me quote Lev Kopelev’s anguished confession: “In the terrible spring of 1933, I saw people dying from hunger, I saw women and children with distended bellies, turning blue, still breathing but with vacant lifeless eyes. And corpses – corpses in ragged sheepskin coats and cheap felt boots; corpses in peasant huts, in the melting snow of the old Vologda, under the bridges of Kharkiv. Fred Beal, an American Communist whose idealism brought him to work at the Kharkiv Tractor Plant in 1933, was a witness, not a participant. “I watched on the sidelines,” he wrote, “ashamed of being a party to the system that was murdering these innocent people … I had never dreamed that Communists could stoop so low as to round up hungry people, load them upon trucks or trains, and ship them to some wasteland in order that they might die there. No one knows for sure how many people were murdered during that horrible year. As Nikita Khrushchev put it, “No one was keeping count.” Robert Conquest, the great historian of the Famine, estimates 7 million victims. Did Duranty know better? He sure did. In “The Harvest of Sorrow,” Dr. Conquest cites a September 30, 1933, dispatch from the British chargé d’affaires to Moscow: “Mr. Duranty thinks it quite possible that as many as 10 million people may have died directly or indirectly from lack of food in the Soviet Union during the past year.” Others reported a similar disconnect between what Duranty knew and what he reported. So why did he do it? His book from 1937, “I Write As I Please,” offers a clue: “Am I wrong in believing that Stalin is the greatest living statesman?” Mass murderers can’t be statesmen, so Duranty decided there could be no Famine. As far as I know, the Pulitzer Prize Committee has never moved to revoke Duranty’s prize and The New York Times has never publicly repudiated it or offered to return it. The Western press is not the only institution that denied the existence of the Famine. So did the Soviet Union – obviously. For more than half a century, any mention of the Famine was punished with a long prison sentence. Today in Ukraine, people know about the Famine, but it is largely a repressed memory. This affects the national psyche, permitting Communists to run for office without shame or remorse. Unfortunately, their influence on Ukraine’s economy is enormous, since the Communist Party constitutes the core of a parliamentary coalition that blocks legislation to dismantle the state-run farms, the Famine’s malignant legacy. These bloated, bureaucratic structures provide the apparatchiks who run them with political patronage and allow them to divert agricultural resources to their own purposes. As a result, Ukraine gets little benefit from her greatest potential asset: agriculture. The International Monetary Fund and the World Bank are ready to help Ukraine, with the United States poised to provide political backing, but reforms must be approved first, including the privatization of land. Vice-President Al Gore delivered that message in Kyiv on July 22, and he was right to do so. There’s no point in subsidizing the collective farm system or other wasteful, inefficient Ukrainian institutions. As for the majority of Ukrainians, they undoubtedly favor land reform, but this is a country where Communists have a 75-year head start on political organization. What the CPU lacks is the vision for a positive program; they only have the means to block change. This cannot be sustained forever. Today, seven years after declaring independence, Ukraine’s problem is spiritual as much as it is political and economic. The country has to confront its past and come to terms with it, the Famine above all. That process has hardly begun. For such a huge historical event, such an enormous crime as the Famine, surprisingly little scholarly and literary work has been done. Dr. Conquest, obviously, stands out. So does Jim Mace, who directed the U.S. Commission on the Ukraine Famine, as well as Slavko Nowytski who produced the film “Harvest of Despair” and, of course, The Ukrainian Weekly. There’s a scattering of other books and materials, but little of recent vintage or mass circulation. The New York Times could help enormously by acknowledging and fixing Walter Duranty’s mendacious work from 65 years ago. Nothing would help more, though, than having Verkhovna Rada approve the privatization of land. I can’t think of a better monument to the victims of the Famine or a more fitting way of telling their descendants – the nation – we’re sorry. The Ukrainian Weekly, August 2, 1998, No. 31, Vol. LXVI, Roma Hadzewycz, Editor-in-chief, P. O. Box 280, Parsippany, New Jersey. Published by the Ukrainian National Association. All this was happening and then they became the Ally of the US, British and Canadian military in WWII. The Invasion of Poland was a Soviet military operation that started without a formal declaration of war on 17 September 1939, during the early stages of World War II. Sixteen days after Nazi Germany invaded Poland from the west, the Soviet Union did so from the east. The invasion ended on 6 October 1939 with the division and annexing of the whole of the Second Polish Republic by Germany and the Soviet Union. The Soviets often failed to honour the terms of surrender. In some cases, they promised Polish soldiers freedom after capitulation and then arrested them when they laid down their arms.Some Polish soldiers were murdered shortly after capture. The USSR refused to allow Red Cross supervision of prisoners on the grounds that it had not signed the 1929 Geneva Convention on the Treatment of PoWs and did not recognise the Hague Convention. Thousands of the POW’s were Polish. The execution of 25,700 Polish “nationalists and counter-revolutionaries” kept at camps and prisons in occupied western Ukraine and Belarus became known as the Katyn massacre. which was blamed on Hilter. At the time even though it was Hitlers people who found the mass graves and brought in outsiders to do autopsy’s etc. On 13 April 1990, the forty-seventh anniversary of the discovery of the mass graves, the USSR formally expressed “profound regret” and admitted Soviet secret police responsibility for the mass murders. If they want to find more bodies they may be underr a pine tree forest. People may think Hitler was bad but the US and the USSR were just as bad if not worse. After the war millions in Germany were also starved. The US and the USSR used the same method to kill millions.The Morgenthau Plan was a shameful, horrific way to kill. No one was spared not even the children. The US nor their Allies can ever hold their heads up and say they are better or more civilized then another country. 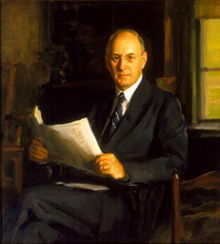 Morgenthau was born into a prominent Jewish family in New York City, the son of Henry Morgenthau Sr., a real estate mogul and diplomat, and Josephine Sykes. Remeber the USSR murdered about 7 million in premeditated, genocidal man made, famine, of 1932-33 just previous to WW II. But that was OK with the Allies who condemned Germany. So why didn’t any one help the 7 million Ukrainians that had been murdered and starved? Approximatly 5 million died of starvation in German becasue of the The Morgenthau Plan.